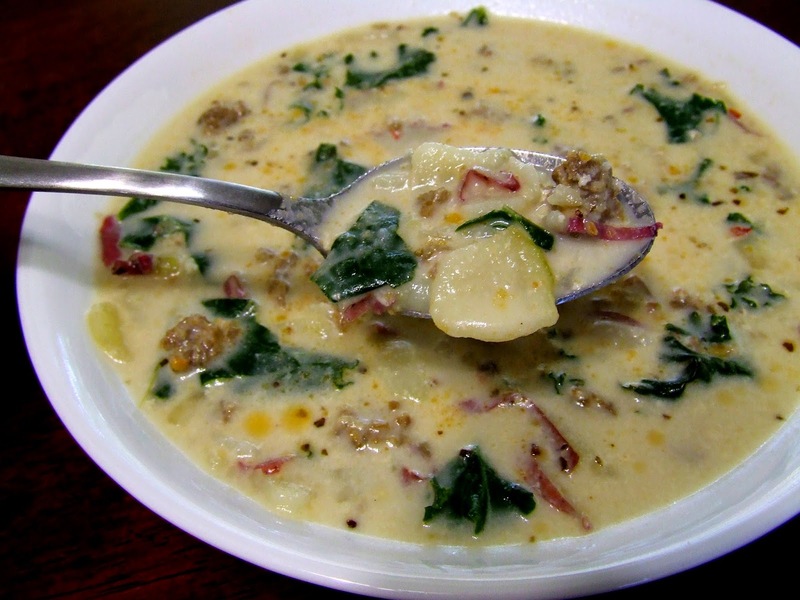 Rustic potato soup - borrowed image. One of my favorite dishes from an unnamed Italian restaurant is this very soup. It's hearty, simple, and most of all, delicious. I've seen other versions of this recipe, but I assure you - once you make this, you will never pay the restaurant for their version again. Heat some oil in a deep pot. Add sausage, Brown sausage, chopping it into small chunks as it cooks. Remove sausage from pot with a slotted spoon and set aside; leave drippings in pot. Add onion and garlic, saute at low - medium heat until slightly translucent, then add the wine and stir to finish deglazing pot. Pour chicken stock into pot and add potatoes. Add the salt and cook until potatoes are nearly cooked though. Toss in bacon, wait ten minutes. Add sausage back and cook for about 10-15 minutes. Taste and season as you go, this soup works well that way. Drop heat to low, add cream and kale. Stir it in thoroughly and serve. Serves 6 to 8 well. This is my favourite soup, I made this recipe and it is tastes EXACTLY like the unnamed restaurants soup!!! !